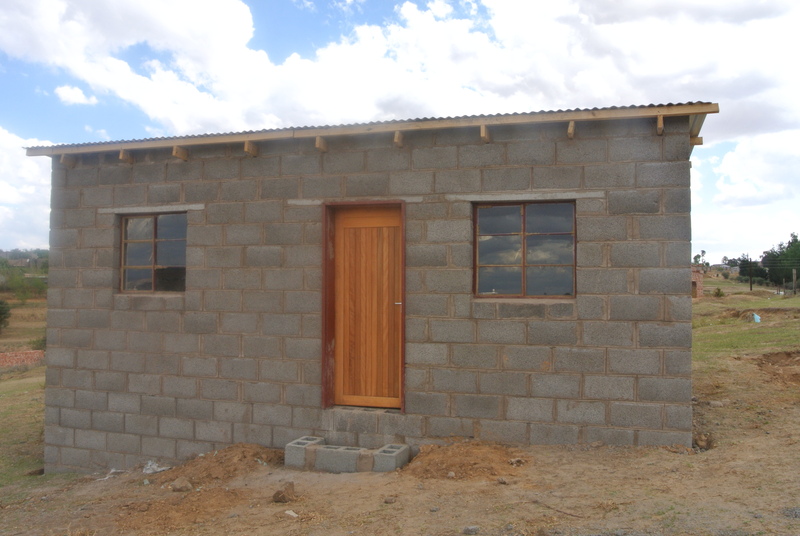 Welcome news from Lesotho: Habitat house is complete! | Oh, the Places We See . . .
For those of you who read our post — A dream deferred: Political unrest delays Habitat build in Lesotho — you can imagine how excited we were to open an email from Kelle Shultz, Director of Habitat for Humanity Knoxville. In that email were pictures forwarded from Setoko Hlabathe, the Habitat Host Coordinator in Lesotho — pictures of the now-completed house in a little village near Maseru, Lesotho. The Habitat house in Lesotho is finished! And we’re celebrating halfway around the world! Many people in Lesotho gave it their all to complete this home, built entirely by hand of concrete block and mud. The project began with Habitat for Humanity, but was interrupted by an attempted coup to oust the prime minister of Lesotho. The children who will live here — in their newly finished home in Lesotho. But now, we’ve come full circle. The house is finished. The family has a new home. And three deserving children face blue skies and white clouds as they look to the future from their doorstep! It’s a new day! For more about our travels in Lesotho and South Africa, check out the Page at the top of this blog. And thanks for stopping by. Click here for A dream deferred: Political unrest delays Habitat build in Lesotho. This entry was posted in Habitat for Humanity, Lesotho, Travel and tagged Habitat for Humanity, Habitat house, Habitat International, Kelle Shultz, Lesotho, Setoko Hlabathe. Bookmark the permalink. 13 Responses to Welcome news from Lesotho: Habitat house is complete! I’ve heard of Habitat for Humanity here inNew Zealand, Rusha. I imagine it would be very satisfying to be part of a project like this. 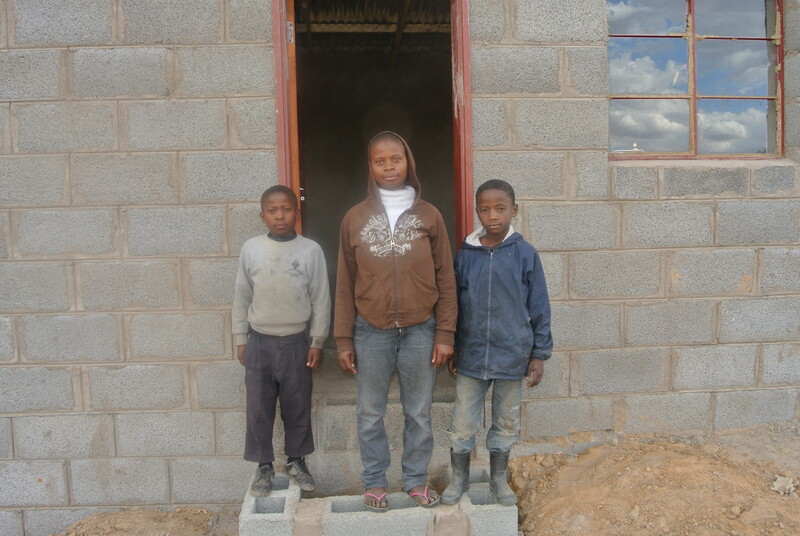 Congratulations on your part in building this house for these three children. Thanks for commenting, Jill. A friend of ours built in New Zealand just a couple of years ago. I wish we could have gone, too, because I really would love the opportunity to see the country. Habitat is in many parts of the world. It’s known as Habitat International or Habitat Global Village. It is, as you said, very rewarding to build a home for someone who truly needs one. And we’ve been lucky to have had the opportunity. Best wishes for a great week ahead! Thanks so much! I feel so very fortunate to have been a part of the process . . . even though it was such a short, short time. Great news! Thanks for coming back to the topic to share the update with us, I’ve been thinking about this family and hoping their home was complete. It IS nice to see something come full circle. I’m also hoping that the doorstep can be finished a bit and some landscaping added. (Does that sound too much like a woman, or what?) Thanks for your comment. It’s great to know that friends all over America share in our joy. Have given the three children a safe place, a hope, and much love… Congratulations! Thank you for sharing such a moving story, Rusha! You are quite welcome. It’s so nice to know that people I haven’t even met are as thrilled as we are that this family has a better place to live. We appreciate your concern for the project and for the kids. Giving three children a chance in life. Congratulations. Thanks so much, Curt. You are right. It is a good chance at a better life. The house seems quite sound and in a safe neighborhood — with a spectacular view. I’m so very happy for the family. Thanks for commenting. Thanks, Linda, for your kind words. It really is wonderful news and a wonderful gesture on the part of the community.